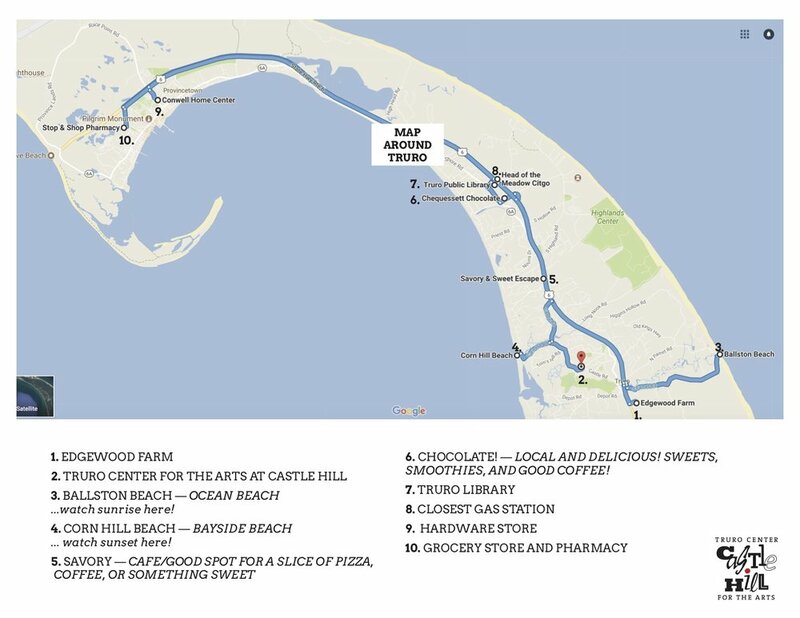 Truro Center for the Arts at Castle Hill is very excited to announce that we now have housing available for students who are taking workshops at Castle Hill. Castle Hill purchased the beautiful Edgewood Farm campus which enables us to offer student and faculty housing as well as new studio spaces. We have renovated all spaces to accommodate a wonderful experience in a comfortable and beautiful setting. There are 5 - 7 bedrooms available to students each week. Reservations are on a first come, first serve basis. Most of the rooms have a private bath, while two have a shared bath, and each has a full or queen sized bed. Kitchen facilities are shared among residents. All kitchens are equipped with appliances (including coffee pots! ), utensils, and basic cooking needs. Students are responsible for providing their own food. Rooms do not have telephones or air-conditioners (though fans will be made available). Students must bring their own sheets, towels and toiletries. Laundry facilities and wireless internet are available on site at no extra cost. If sharing the room with a second person (i.e. significant other or friend) the cost is $150 extra per week. Payment is due in full at time of reservation. Check-in is Sunday afternoon and check-out is by noon on Saturday. Please note we cannot accommodate early arrivals or late departures. *No Pets & No Smoking. Students are expected to leave their room clean. A cleaning fee will be charged for rooms that require extra cleaning. Please be sure to review our Cancellation Policy below. If you cancel your housing up to 60 days prior to the day of your arrival, you will receive a full refund, minus a $25 processing fee. If you cancel your housing up to 30 days prior to the day of your arrival, you will receive an 80% refund, minus a $25 processing fee. If you cancel your workshop and/or housing less than 30 days prior to workshop start date, you will forfeit your entire payment. In the event that your workshop is cancelled, you will receive a refund in full.